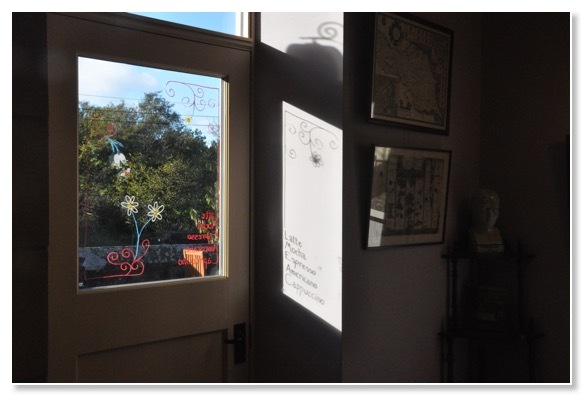 Our final couple of weeks are made up of mostly cold clear days with autumn sunshine and long shadows. Customers braving the chill are pleased to find our log burning stove lit and our warming autumn soups sell well, as does hot chocolate. Half term is busy, especially the middle of the week for no particular reason we can fathom, with periods when all seats are full and people are waiting to be seated and served. We manage though. Halloween prompts some of our younger customers to arrive dressed for the coven and one or two adult customers let their gothic side predominate. 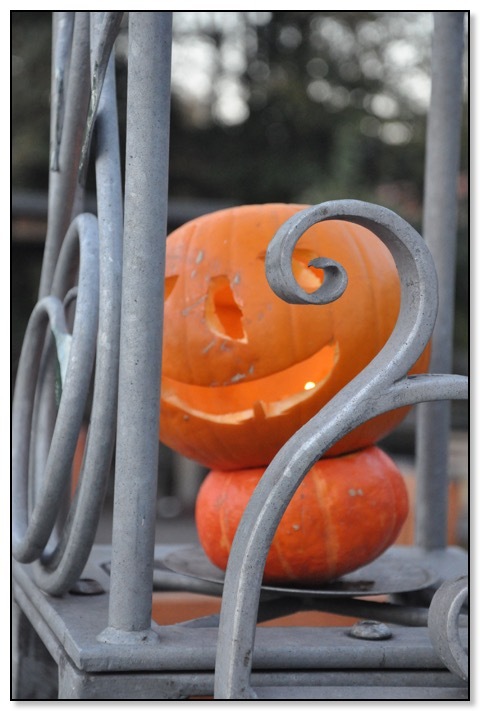 We acknowledge the occasion with Jack o’ Lanterns in our entrance gate. At the end of October our Premises Licence is granted by the Borough Council. This is just in time for our first evening event which took place on the 2nd of November. We hosted the Grosmont Writers’ Group with readings from their newly published collection of stories: ’ Time Well Spent’. We managed to seat forty people in the Coffee Shop, creating a performance space at one end of the room and using our rescued theatre seats as the front row. It’s a good night. Our licence means we can fulfil our plan to stage some arts events in the evening starting next spring. Bill has installed some lighting in anticipation of this. We want to recapture some of the fun we had promoting arts events when we lived in Gloucestershire. We were involved in running a community arts centre there. The licence also means we will be able to offer wine and beer alongside our other beverages when we open next season. We close for our winter break on Sunday the 3rd of November. We will reopen next February just for the week of half term and then start with weekend opening in March. This month we’ll be doing the end of season cleaning and maintenance jobs before taking a proper holiday. It’s a chance for us to enjoy living in this part of the world and, when we feel like it just curl up with a book in front of our own log burner. If only someone else could make the coffee!